SQL Server maintains data integrity and system stability by adhering to the ACID properties which is an acronym for Atomicity, Consistency, Isolation and Durability. The isolation part of this acronym states that all transactions are run in isolation from each other and no two resources can update the same data or definition of a SQL object at the same time. In the pessimistic isolation levels (Read Uncommitted, Read Committed, Repeatable Read and Serializable) this is controlled by locking. In the optimistic isolation levels (Read Committed Snapshot and Snapshot) this is controlled by row versioning. In this post I’m only going to deal with the four pessimistic isolation levels. The are several types of locks, including shared, exclusive, update, intent and schema. To start with we’ll just look at shared and exclusive, as these are the critical ones for getting an understanding of how SQL Server uses locks when reading and writing data. The locks can be placed on various resources and by default this is handled by SQL Server. For example, if you are just updating one row in a table then SQL Server will most likely just place a lock against that one row. If you are updating every row in a table then most likely the whole table will have a lock placed against it. The way locks behave is controlled by the isolation level and the the default level is READ COMMITTED. At this level shared locks are requested when reading data and are released once the data has been read. They are not held on until the transaction commits. Exclusive locks are requested whenever data or SQL objects are updated. In the default level these are not released until the transaction commits. If a resource has a lock held against it then another transaction that tries to access the same resource (by requesting a lock) may be blocked. Blocking will occur if the lock currently held is incompatible with the newly requested lock (see below for more on lock compatibility). Exclusive locks are not compatible with other exclusive locks or with shared locks. Shared locked are compatible with each other but not with exclusive locks. This means that two transactions can issue shared locks on a resource and can both read the data. It also means that one transaction cannot update data until another transaction has finished reading it, and one transaction cannot read data that is being updated by another transaction (except in the READ UNCOMMITTED isolation level which is discussed in the next section). There are four isolation levels that use locks and these allow you to control whether you want more consistency or more concurrency in your application. The greater the consistency, the lower the concurrency and the greater the concurrency, the lower the consistency. If you want more resources to be able to access the data quicker then you need to reduce locking which may reduce the consistency of the data. If you want more consistency in your data then you may have to holds locks for longer which can cause more blocking and can reduce concurrency. From one connection begin a transaction and update the row in dbo.IsolationLevelTesting. This will leave the transaction open with an exclusive lock. Now from a second connection set the isolation level to READ UNCOMMITTED and select the data from dbo.IsolationLevelTesting. You should see the value Peacock returned which is the uncommitted version. Now rollback the transaction from the first connection. Re-run the select statement from the second connection and you should see the data is back to Simon. You can also use hints to override the existing session transaction isolation level and can use the following to run the select statement in the READ UNCOMMITTED level. In my opinion you should only use the WITH (NOLOCK) table hint in your operational production systems in exceptional circumstances. If you are having performance problems and think using the WITH (NOLOCK) table hint will fix them then you probably need to first look at the code that is requesting the exclusive locks (or other incompatible locks) on the resource you are trying to access and optimise that. Remember that in the READ UNCOMMITTED level any select statements will read the dirty uncommitted data and not the original data before it was locked. Start a new transaction in one connection and update the data in dbo.IsolationLevelTesting. Now from a second connection set the isolation level to READ COMMITTED and then try and read from dbo.IsolationLevelTesting. You’ll find that the read request doesn’t return and just hangs. This request is blocked by the open transaction in the first connection and will just hang until the lock is released. Now is an appropriate time to look at how we can view what locks are currently in place and whether any of them are blocking other requests. The SPID of my first connection with the open transaction is 51 and the SPID of the second connection with the hanging read request is 52. Here you can see all the different locks that are placed on the various resources within each session. The first four rows show the locks taken out for SPID 51 which is the one with the open transaction. You can see that there is an exclusive lock (request_mode = X) placed on the KEY resource_type. The KEY value means a row in a clustered index (which was created by default because of the PRIMARY KEY). You can also see that there is a shared lock (request_mode = S) on the DATABASE and intent exclusive locks (request_mode = IX) on the OBJECT and PAGE resources. Intent locks are used to allow SQL Server to determine if there are any locks further down the resource chain that would prevent a lock being placed on a higher-level resource. For example, if there was an exclusive lock on a single row in a table, there would be an intent exclusive lock on the page and the table. If a query was run to select all data in the table, then a shared lock on the table would be requested. Because there is already an intent exclusive lock on the table, SQL Server knows that the requested shared lock on the table must wait until the exclusive lock further down the resource chain is released. This removes the need for SQL Server to scan every page and row to check for locks. The second four rows in sys.dm_tran_locks show the locks taken out for SPID 52 which is the hanging SELECT statement. You can see there is a shared lock (request_mode = S) at the KEY level that has a request_status of WAIT. This means this lock is waiting for the resource to become available. You can also see the shared and intent shared locks on the DATABASE, PAGE and OBJECT resources. There are also several other ways to identify and monitor locks and blocks but these you usually enough for me to work out what is going on. If we now go and commit the open transaction in the first connection the new value is committed to the database, the exclusive lock is released and the shared lock from the second connection is allowed in and the newly committed data is read. From one connection set the level to READ COMMITTED, begin a transaction and select the data from dbo.IsolationLevelTesting. Now back in the first connection with the open transaction re-run the SELECT statement and commit the transaction. Set the isolation level to REPEATABLE READ, begin a transaction and then select from the table. We can now see the shared lock on the KEY that is still being held as the transaction is still open. Now we can see the exclusive lock at the KEY level waiting for the resource to become available. If we go back to the first connection and re-run the SELECT statement we will still see the original value of Updated returned. If we now commit the transaction the exclusive lock in the second connection is granted, the data will be updated and if we re-query from the first connection the updated value of Repeatable will be returned. Obviously as locks are held for a longer time there is going to be more blocking on other requests and this could reduce concurrency. However, please note, it is only incompatible locks that are blocked. The transaction is still open and the shared locks still exist on these three rows. This means these rows cannot be modified as an exclusive lock would be blocked. If the transaction that did the insert of the row with Id = 3 is rolled back and the SELECT statement in the first transaction is re-run then only the original three rows are returned. This is a phantom read and is where over the course of a transaction, two or more identical queries are run and the data sets returned are different. To combat this we can use the serializable level. This is the last of the four levels and is the strongest as far a consistency is concerned but will also cause the most blocking and is more likely to reduce concurrency. In this isolation level key-range locks are used which stop data being added that satisfies the conditions of a SELECT statement in an open transaction. If we commit the first transaction the waiting lock will be granted and the insert will happen. More details on key-range locks can be found here. You can browse with Microsoft documentation to view all the different types of locks that SQL Server can take as well as what resources they can be taken on. There is also a matrix that shows lock compatibility. In addition to the four transaction isolation levels that use locking there are also the SNAPSHOT and READ COMMITTED SNAPSHOT levels. Rather than placing locks on resources, previous versions of data are stored in tempdb. I hope to talk about these in a separate post at some point in the future but for further reading please see the MS documentation. In most cases the default READ COMMITTED transaction isolation level is the one to use. It’s always good practise to keep you transaction as short as possible as this will prevent locks being held for a long time. Prior to Visual Studio 2013, SQL Server Data Tools (SSDT) was a stand alone application that you could install in the VS2010 or VS2012 shell. 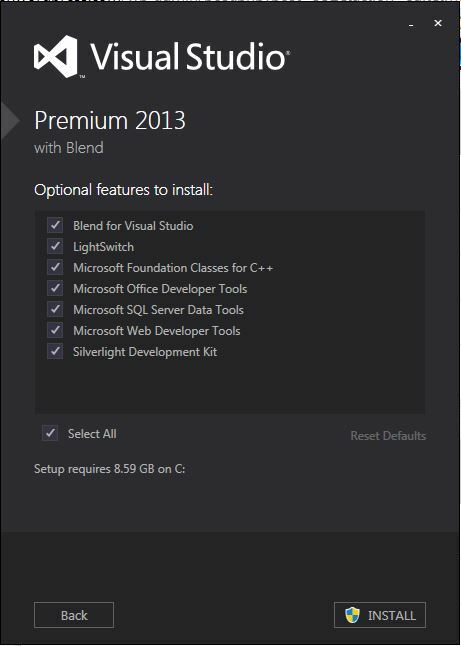 Now it’s one of the optional extras in the install of VS2013. I’ve installed VS2013 with the SSDT optional feature and opened an existing database solution that was originally created in VS2012. The solution opens fine and there is no upgrade required by the looks of it. At first glance it looks like it will all just work okay. I was then able to reopen the solution in VS2012 and that still seemed to work okay as well so it looks likes you can use SSDT database solutions in both VS2012 and VS2013 without any conversions or upgrades and you can pick and choose which version you want to use. We’re currently look into upgrading from SQL Server 2008 R2 to SQL Server 2012. I think the plan is to detach the existing databases, install 2012 and attach to the new instance. 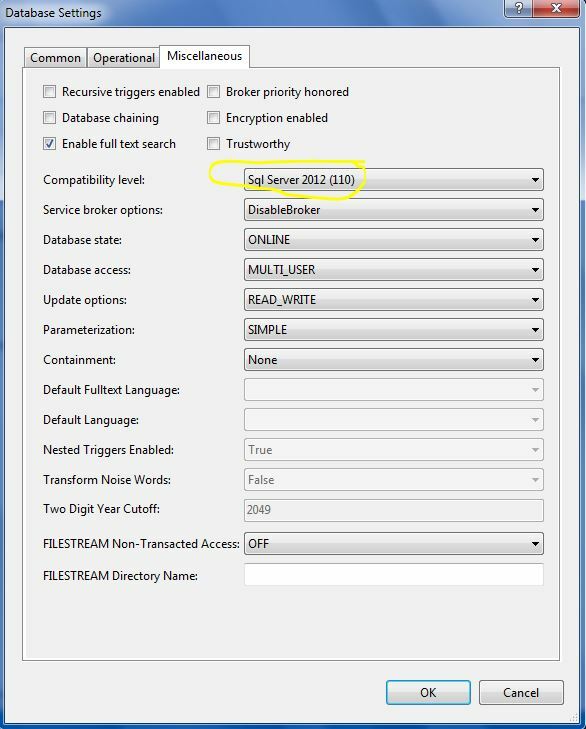 Once we’ve attached we will set the compatibility level in the databases properties to be SQL Server 2012. Our databases are under source control in TFS using SSDT for VS2012. We have several enivornments that we will need to upgrade and to make sure we don’t forget to update the compatibility level we will update it in our SSDT projects and then it will get updated when we publish. 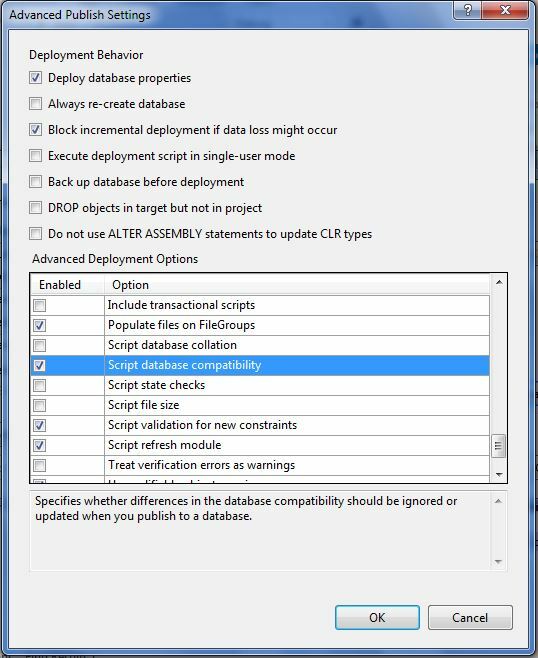 To set the compatibility level in SSDT click on the “Database Settings…” button in the “Project Settings” tab of the database properties. Then under “Miscellaneous” select the required value from the “Compatibility Level” drop down. 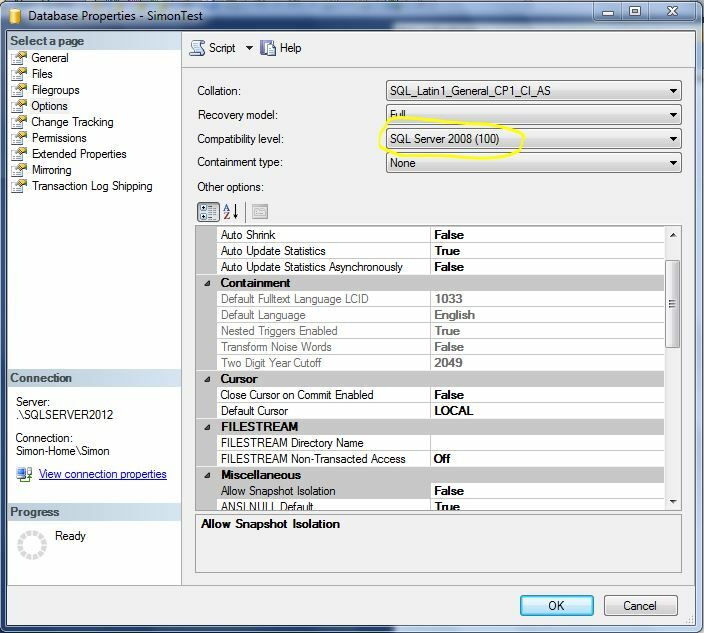 However, by default SSDT doesn’t check for differences in the compatibility level when it publishes a database project. You can enable it in the “Advanced” settings of the “Publish Wizard” and then save the publish profile for later use. Then if there is a difference between the compatibility level in your database and project a statement similar to the following will be included in the publish script.